What causes a ministry to grow? Is it the programming? The worship music? The children's ministry? The student ministry? Small groups? Sharp branding and marketing? Nice facilities? Let's look at it this way. How do you successfully bake a cake? You add in the ingredients, don't you? Flour. Sugar. Eggs. Butter. Salt. Baking powder. Vanilla. Eggs. You mix all the ingredients together. But it's still not a cake. What turns the ingredients into a cake is the heat. Without the heat, it will never be a cake. You see...the programming...the worship music...the children's ministry...the student ministry...small groups...sharp branding and marketing...nice facilities...those are the ingredients. But without the heat, without the fire applied to those ingredients, the ministry will fall flat. Zechariah articulates this when he says, "it is not by might, nor by power, but by My Spirit, says the Lord." The secret that makes a ministry grow is the anointing of the Holy Spirit. At times, I have found myself going to a conference or visiting a growing church and then spending more time trying to implement the ingredients than I did begging the Holy Spirit to bring His fire to the ministry. Anyone else guilty of this? What we need more than the latest program, more than another cutting-edge growth strategy and more than the coolest new sound system, is the fire of God to fall on our ministries. Does that mean we don't have to make our ministry ingredients relevant and the very best we can put together? No. Just like we wouldn't throw together the wrong ingredients and expect to see a great cake baked up, we shouldn't expect God to bless halfhearted efforts or out-dated ministry ingredients. We should gather our very best ministry ingredients and then place them before God to anoint with His fire. When great ingredients are anointed by the fire of the Holy Spirit, you will see a ministry begin to grow. The fire of the Holy Spirit is the extra "it" factor that causes a ministry to move from mundane to miraculous. Interview the Pastor and staff of a church that is experiencing miraculous growth and they will tell you they do their best, but they're quick to acknowledge that they're simply not good enough or smart enough to produce the kind of growth they are seeing. They'll quickly tell you that only God can bring the kind of growth that is happening. Look behind their music, programs, videos, strategies and facilities and you'll find a group of people desperately crying out to the Holy Spirit to do great things. That's the POWER that takes the ingredients of a ministry and uses it to produce growth. May God stir up within us a longing to see the Holy Spirit move in and through our ministries. May God find us on our knees before each service, begging the Holy Spirit to anoint us. May God find us desperately crying out to the Holy Spirit to do what we cannot do...produce fruit through our ministry. 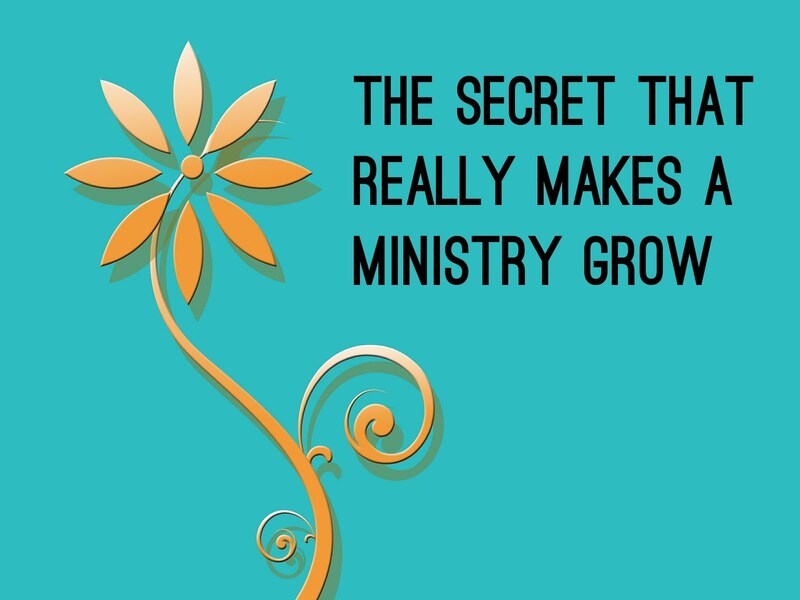 That's the secret that really makes a ministry grow. And the good news...it's available to all of us.